The Martine Inn occupies a lovely mansion that was originally built in 1889. 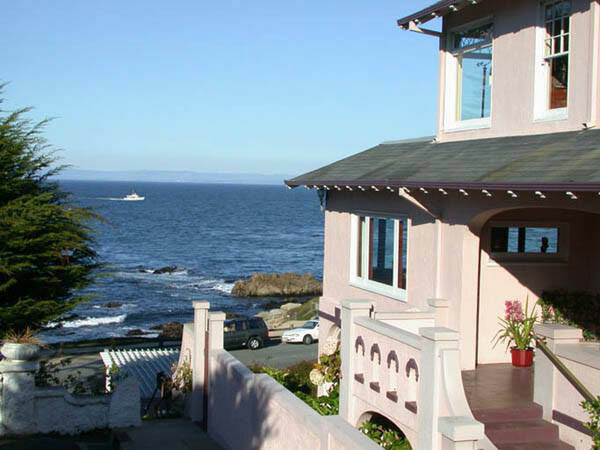 Guests are treated to wonderful views of Monterey Bay from the property’s priviliged location, and within easy reach are such area attractions as Cannery Row, the Monterey Bay Aquarium, art galleries, and shops. Regardless of what guests have planned for their stays at the Martine Inn, they can begin each day with a full service breakfast. Also offered throughout the course of the day are gourmet coffee, distinguished teas, afternoon cookies, and wine & hors d’oeuvres. All complimentary. The rooms at the Martine Inn are soundproofed and feature such delights as antique furnishings, premium bedding, and luxurious bath towels. Units with fireplaces and ocean views are available. In relation to the Martine Inn facilities, they include ocean view sitting rooms, a game room with a historic pool table, a library, and a relaxing courtyard with a fountain and small pond. For extra relaxation, guests of the Martine Inn can treat themselves to the available spa services, which include massages, aromatherapy, wraps, and facials. Also worth noting are the hotel’s classic car collection, its artwork, its historic reproducing piano, and its antique silver collection. These are all available for guest viewing.